A wild swim in a remote water hole. Bitter Springs, NT (photo: Jennifer Pinkerton). Leave urban pools behind and open your mind to the brave new world of ‘wild swimming’ at Bitter Springs, south of Darwin. All you need is confidence, four wheels and a hearty dash of wanderlust. Wild swimming in the Top End is best from May to August. Elsey National Park (photo: Jennifer Pinkerton). As I breaststroke through blue-and-emerald bliss, the sun clips something ahead of me in the water. Glistening in the late-afternoon light, the object looks lumpy, green and as long as a school ruler. But there’s no-one around to witness this riot of anxiety – least of all Paul. He’s holding our five-month-old baby, waiting for me at the other end of this stream’s loop. Is it a croc or a log? a heart-pounding dip in Elsey National Park (photo: Jennifer Pinkerton). But putting the unknown element of my current situation aside, the winding waterhole is so beautiful it could well rob Heaven of its title should the two places do battle. 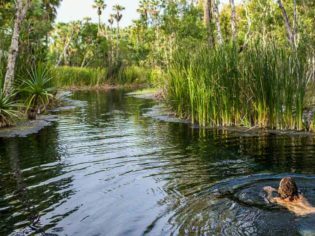 Bitter Springs, a 420-kilometre drive from Darwin, lies tucked inside the frond-filled Elsey National Park. If ever there were a ‘wild swim’, this would be it. Remote?Check. Adventurous? Check. This NT waterhole is regularly patrolled for crocodiles by the rangers. (photo: Jennifer Pinkerton). This paddle forms the first stop on our quest to plunge into two of the Northern Territory’s prettiest remote waterholes – an idea inspired by a growing swimming movement of which I’ve recently caught wind. Wild swimming, as it’s been dubbed, gathered momentum in the UK about a decade ago with the formation of the Outdoor Swimming Society. Lamenting a rise in indoor-pool culture and a decline in ‘swimming under an open sky’, proponents believe that chlorinated, fenced-in conditions rob the activity of its spiritual qualities. Bitter Springs is surrounded by green foliage. NT (photo: Jennifer Pinkerton). These include swimming’s capacity to connect us with wilderness, induce joy, help us to lose track of time and allow us to dream in sync with water’s breaths, currents and tides. After all, wild swimmers say swimming has its roots in the exploration of rivers, oceans, waterfalls and beyond – not in concrete-lined urban pools. Bitter Springs is listed on the new site Wild Swimming Australia, yet, at the time of writing, the location’s entry remains unpenned. That lump hasn’t gone anywhere, and soon enough I’m convinced the object in question is more logodile than crocodile. I dive back into the springs and meander through the remaining loop. Here, the stream thins to a tight corridor. Bitter Springs is one of the Northern Territory’s prettiest remote waterholes (photo: Jennifer Pinkerton). A wall of tall, luminescent green reeds lines one bank, while bursts of pandanus stretch crooked limbs over the water’s surface from the other side. Two finches, the size of shot glasses, take turns dipping into the stream ahead of me. They flutter their wings in the springs, making a staccato sound akin to a mini propeller. My mind switches to rancho relaxo mode and, as I flick my feet in the 34ºC waters, any residual croc fear dissolves. With the birds now behind me, I spot Paul on the footbridge in the distance. I freestyle the final stretch and unleash a babble of excited gibberish upon exiting the water. He reassures me that all NT public waterholes are vigilantly monitored for crocs by parks staff. I feel safer in that knowledge, so wild brumbies can’t keep me from dashing past palm trees to swim the loop again – on repeat until sunset. Here, in the dying light, I feel everywhere and nowhere. I’m floating. I’m had. I’m wild swimming seduced. Wild swimming in the Top End is at its best and most accessible during the early dry-season months from May to August. From Darwin, drive 420 kilometres south along the Stuart Highway to reach Elsey National Park.